We offer Floor Box Cushions in a plethora of colors, designs and weaves as per the requirements of clients. 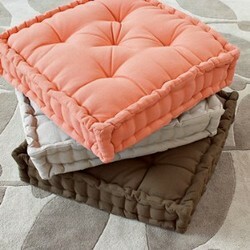 Floor box cushions are light and comfortable to sit in and also add a dash of color to the interiors. These can also be placed on chairs, sofas and other places to experience an artistic and comfy feel. AAA Iimpex was established in 2011. We are the Manufacturer, Exporter and Supplier of Terry Dish Cloths, Kitchen Aprons, Kitchen Pot Holders, Kitchen Napkins, Tea Coasters, Bread Baskets, Beaded Napkin Rings, Designer Table Runners, Table Placemats, Fabric Chair Pads, Decorative Floor Mats, Designer Floor Rugs, Floor Box Cushions, Kitchen Tea Towels, Terry Guest Towels, Kitchen Towels, Terry Hand Towels etc. Our company has lived though it's years of toils and discipline that it takes to mold an idea into reality. The Karur craftsmen help to produce one of the largest, most fascinating varieties of home textiles products for the world. As you enter the south part of tamilnadu, you would be struck by the sheer activity that emanates from the karur city. Where the world has being touched by karur home textiles product across the globe is countless. We forayed into exports and currently exports to Australia, U.K. and South Africa. Our firm objective is to achieve a distinguished identification for our quality products, distributing the same to the domestic and international market. Our trendy products are available in vibrant colors and unique pattern to satisfy the various requirements of interiors in home furnishings.